EpoxAmite™ WHITE 102 Product Information | Smooth-On, Inc. Specific Volume 22.5 cu. in./lb. EpoxAmite™ White Epoxy Laminating System is an easy-to-use liquid epoxy system formulated for a wide variety of fabrication applications. 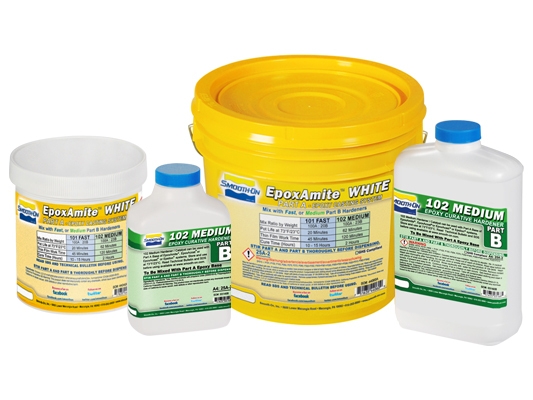 EpoxAmite™ White Laminating System is odorless and cures at room temperature. Cured epoxy displays exceptional physical and performance properties. It can be sanded, shaped, machined, drilled, tapped and painted. EpoxAmite™ White Laminating System can be used with reinforcements such as S-Glass, E-Glass, Kevlar and Carbon fibers for lay-up& applications or composite parts. EpoxAmite™ White Resin can also be mixed with fillers such as fumed silica for gel coat applications. Urefil™ 3, Urefil™ 7 and other fillers can be added for fairing, filleting or bonding applications. Materials should be stored and used in a room temperature environment (73°F/23°C). Elevated temperatures will reduce Pot Life. EpoxAmite™ White Resin and 101 or 102 Hardener must be properly measured and thoroughly mixed to achieve full, high-strength, solid-cure properties. Measuring / Dispensing – Accurate ratio measurement by weight is required for the material to cure properly and develop full physical properties. Refer to specified Mix Ratios in Handling Properties for proper measurements. Dispense Parts A and B proper proportions into clean plastic, metal or wax-free paper containers. Adding Color - EpoxAmite™ White Epoxy Laminating System can be colored with UVO™ or Ignite™ colorants (from Smooth-On). Pre-mix tint with Part A thoroughly and then add Part B. Important - Mixed EpoxAmite™ White Resin with EpoxAmite™ 101 or 102 Hardener is exothermic, meaning it generates heat. A concentrated mass of mixed epoxy in a confined area such as a mixing container can generate enough heat to melt a plastic cup, burn skin or ignite combustible materials if left to stand for its full Pot Life. Do not use foam or glass mixing containers or pour sections thicker than 1/8” (0.32 cm). If a batch of mixed epoxy begins to exotherm, move it to an open air environment. Applying – Mixed EpoxAmite™ White is initially a low viscosity liquid that can be poured up to 1/8” (0.32 cm) thickness. Laminating: cut the bristles of a chip brush 30% for better control. After epoxy is mixed, you must work quickly to apply multiple layers. Brush an initial gel coat of epoxy over surface. Apply reinforcement fabric evenly into gel coat. Using brush, gently use stippling motion to work fabric into epoxy. Ensure fabric ply is saturated. Plastic polyethylene spreaders may also be used. Heat Curing - This product will cure at room temperature and does not require heat. Cure time can be reduced by applying mild heat. The higher the curing temperature is, the higher the resulting Heat Deflection Temperature. With a higher temperature cure, a service temperature of 165°F / 74°C can be attained. Allow epoxy to cure for 30 minutes and then cure for 2 hours at 176°F / 80°C, followed by 1 hour at 212°F / 100°C. Allow casting to cool to room temperature before handling. Painting – Cured EpoxAmite™ White Laminating System can be painted and / or primed and then painted with acrylic enamel paints. Let paint fully dry before putting part into service.